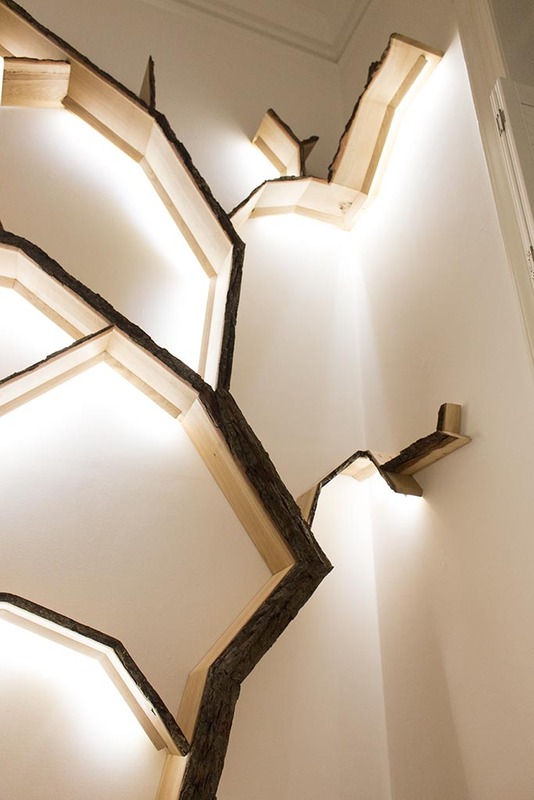 Fitting anything to the wall in houses can present a world of problems. There are many different types of wall and each presents its own issues. 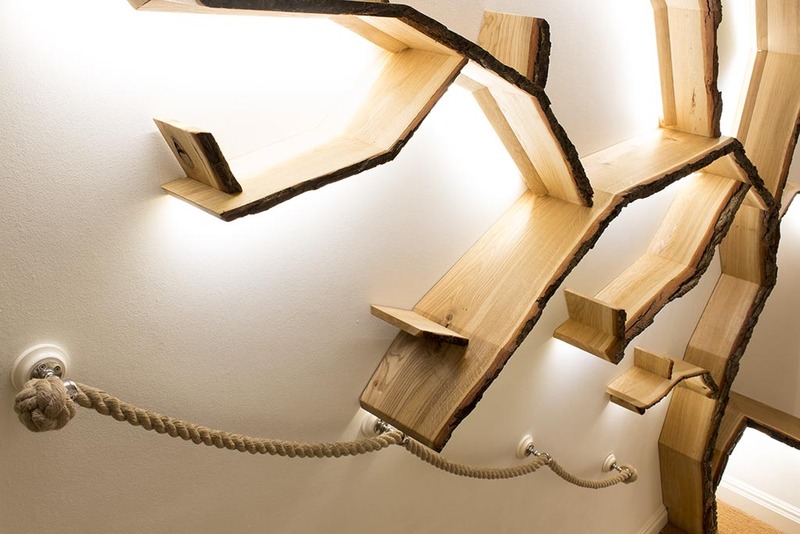 Here you can find some advice on how to fit a floating shelf to different types of wall, along with an explanation of our floating shelf bracket range. Over the years we have had to turn down endless customers because our floating shelves wouldn’t be suitable for their wall. Even worse, we’ve had customers who have had their new shelf delivered, but upon drilling they have found their wall makeup wasn’t what they realised and the shelf can’t be used. Floating shelf bracket options had previously been restricted to solid walls with a standard wall plug and that’s it. In a bid to give our customers the best fighting chance and greater flexibility, we decided to design our own range of floating shelf brackets. These would fall in line with increasing developments in wall fixings and are provided with the best quality wall fixings that are available (as cheap quality, product supplied fixings are a pet hate of ours). As of 2019 we are excited to have finally launched these fixings, all of which you can find in the hardware section on our website. Our standard solid wall floating shelf brackets may appear very similar to current market options, but a few tweaks make them far more versatile. The high quality machined threads will not break during installation, as we have seen in many instances before with cheap quality floating shelf fixings. This variation is supplied with a Fischer UX10 wall plug. This plug far exceeds any others in our opinion, as the sharp wings on the plug prevent slipping during installation and the large expanding section of the plug will hold, should you hit a cavity in the wall during drilling. Our floating shelf brackets all have an interchangeable thread system. You can remove the threaded part and swap it for another type should your wall surface catch you out. This means we can send you a different thread option without the need for replacing the whole floating shelf bracket. You can see the recommended fitting method for our solid wall floating shelves in the video below. By changing out the thread section on our concealed plasterboard floating shelf fixings you can fix your shelf solely to a plasterboard surface, via the use of a Gripit brown fixing. If you haven’t already seen or used Gripit fixings then do go and check them out. Their fixings give incredible strength when securing to plasterboard and they are the sole reason that we are now able to offer plasterboard floating shelves. This fixing will enable you to fit a floating shelf to only the plasterboard section of your wall, without the need for alignment with the stud work or any additional supporting structure. We test these plasterboard floating shelf brackets to a weight of 5kgs, on a 9mm plasterboard wall. For our test we position 5kgs at the end of a 120mm bracket which accounts for the leverage effect experienced with floating shelves. We do this in the worst case scenario of a 9mm, thin plasterboard wall. You can see the recommended fitting method for our plasterboard floating shelves in the video below. Our heavy duty floating shelf brackets should have you covered for the highest load rating that you should ever need from a floating wall shelf. We have tested a pair of these up to 100kgs and were confident they could have taken more (if we had another bag of plaster). These shelf brackets will hold floating sink basin shelves, media shelves for record players and amplifiers. 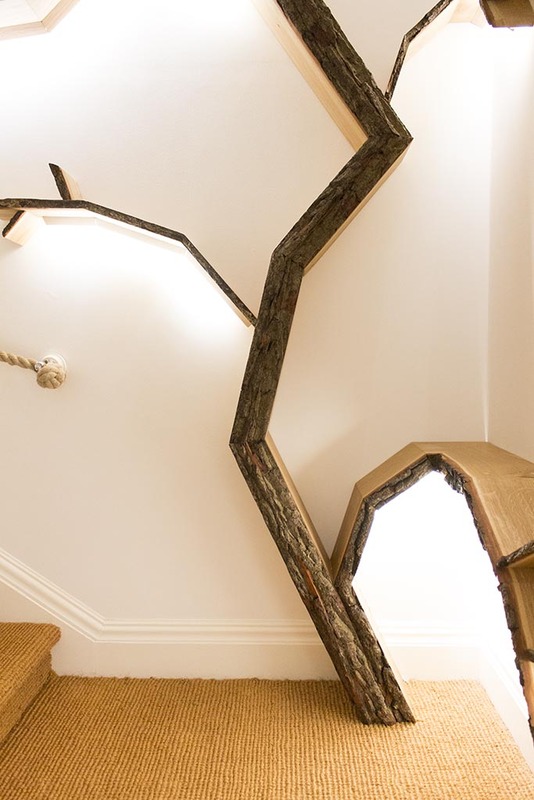 You can use them to form floating bedside tables and a whole range of other uses along the way. If strength and reliability is what you need then these are the bracket to go for. We only recommend that you fit these to solid walls due to the support that is needed on the main floating shelf support pin. You can fit these heavy duty shelf brackets to plasterboard walls but they will need substantial timber work in place behind the wall in order to offer the support needed. It is likely after all that the failure point will be the wall and not the bracket! We recommend installation using a chemical resin method for guaranteed strength and we’ve done a handy video to show you the process. 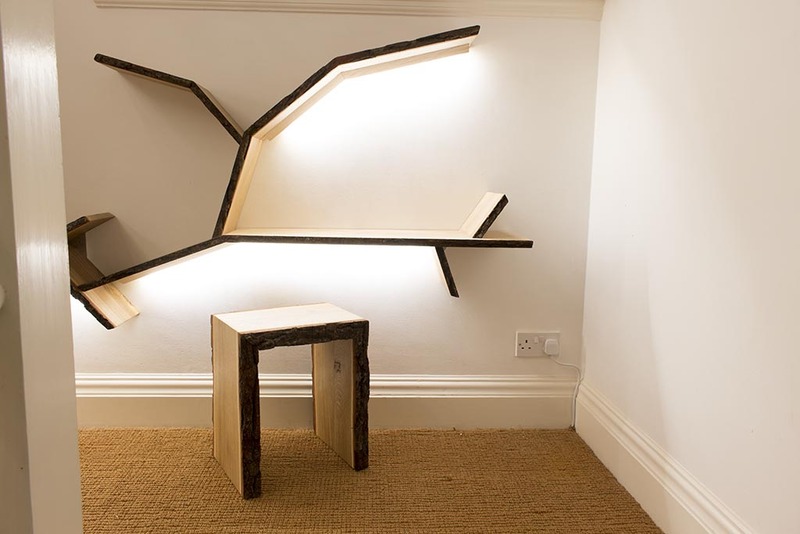 If you are unsure of which of our floating shelf brackets might be best for your application then feel free to contact us and we should be able to offer advice on what might work best for you. There are lots of finishes available across our range of tree shelves and this guide should help you decide on which one will be best for you. When buying items over the internet it can be difficult to be certain about finishes and how things will really look when you get them. Variations in surrounding colour schemes and lighting will both affect this in each instance. We aim to make all of the images on our website as accurate as possible on screen as they are in real life. With variation between devices and screens there will always be some difference in how the finishes look. If you are unsure of which finish will be correct for you then we recommend buying a sample kit – you can browse our range of sample kits here. 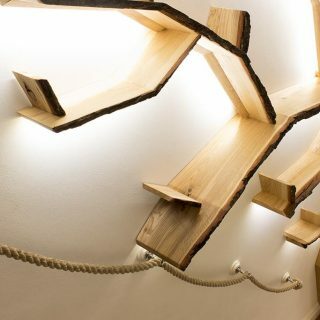 We have two methods that we use for building our tree shelves and the finishes vary between these. 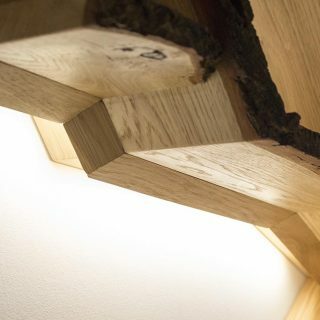 This post explains the finishes available across our segmented tree shelf range. 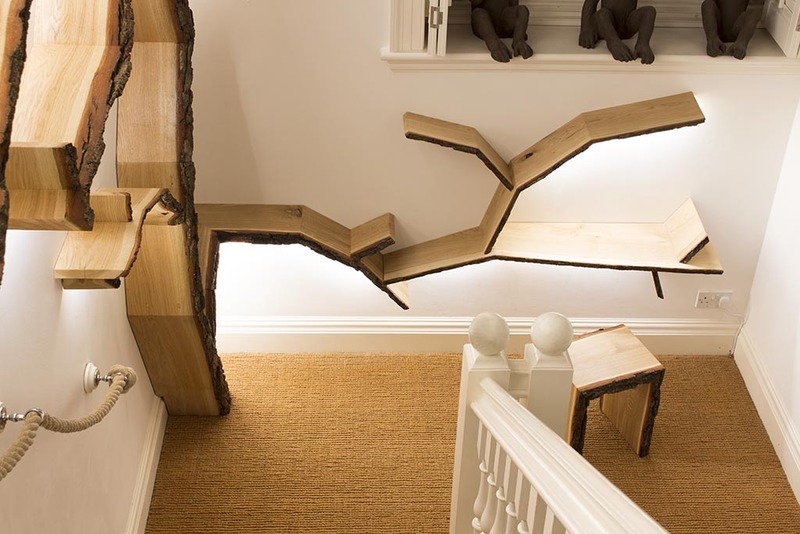 Our segmented tree shelves are all made from solid oak. There are three different edge options and three different finish colours. The variations of these are explained below. Selected from American white oak stock, this finish has very little character with straight grain and is a good match to modern oak furniture. Our American oak is QBA grade, which means that you will rarely see knots that are larger than the size of a biro. The boards are cut straight, have a uniform depth along their length and will be planed and sanded square on all sides, with the corners lightly rounded by hand. Square edge oak is available in standard oil (as shown), dark tinted oil and white limed wax colours. Selected from European Oak, which is sourced from either France or Poland. This finish maintains natural shape to the edge of the board; we remove the bark and sand the board to a smooth finish. Waney edges are different with every piece of wood. Some boards may be quite straight without much character and others may contain more natural shape. The shape of the waney edge is more evident in longer lengths of wood. As they are not straight, waney edge boards are measured as an average along their length. This means that some portions of the shelf may come out undersized and some over. 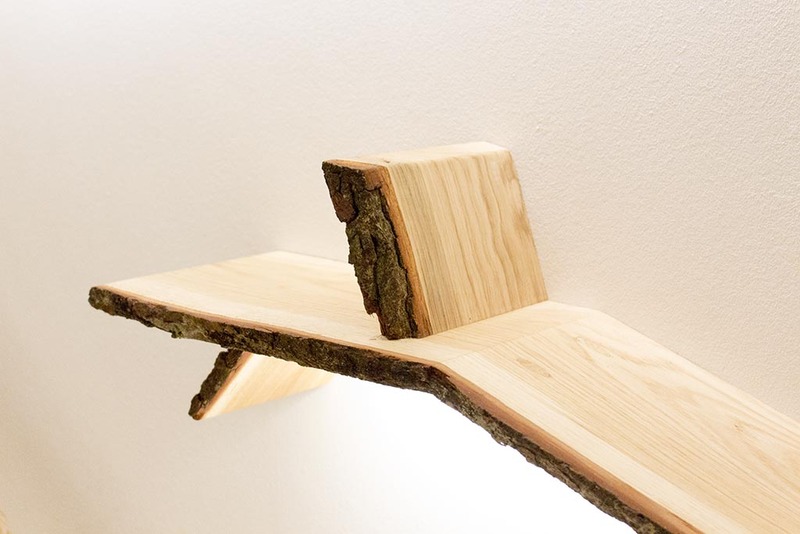 We make waney edge tree shelves at the depth specified plus the wane, which means overall they can be anything from 20 – 50mm oversized in places. We try to source the most charactered boards that we can for this finish. They may include large holed knots and splits (which we deem to be stable). Waney edge oak is available in standard oil (as shown), dark tinted oil and white limed wax colours. Selected from European Oak, which is sourced from either France or Poland. 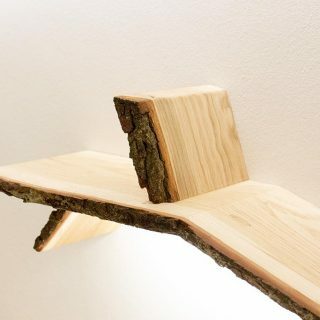 The ultimate in rustic and wild finishes, perfect for a tree shelf! This finish retains the real bark edge of the board and we select only the most solid, untouched bark pieces for this finish. 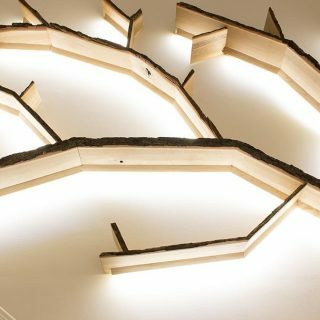 As this is not a manufactured edge it can be fragile; the bark on these boards has already survived the felling, transporting, sawing and kiln drying process, making it very difficult to source. It cannot be easily worked or repaired, so we are very careful to take our time when working with it. 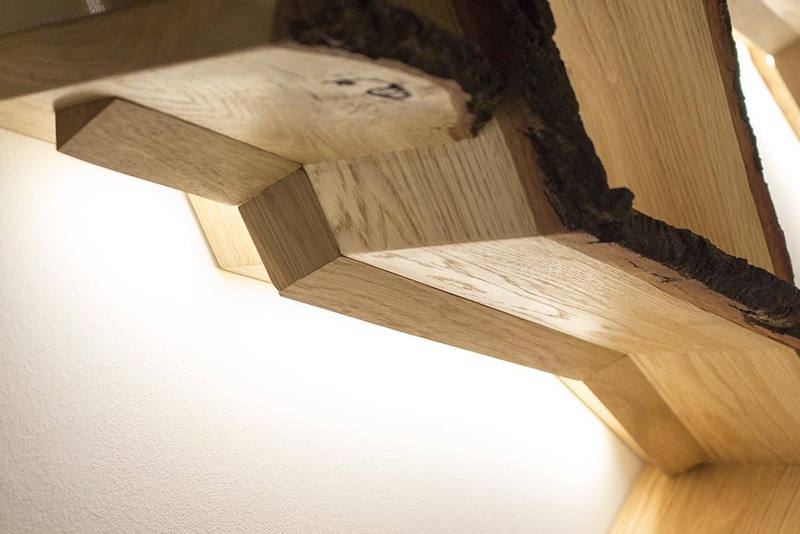 We make bark edge tree shelves at the depth specified plus the bark, so as with the waney edge finish they can be anything from 20 – 50mm oversized in places. We try to source the most charactered boards that we can for this finish. They may include large holed knots, splits (which we deem to be stable) and of course real bark! We recommend the bark edge oak in a standard oil colour as this best complements the contrast between the bark edge and heartwood. We only offer it in this colour as standard but this can be coloured differently as a special request. If you have any queries about which finish may be best for you, then feel free to get in touch and we will be happy to help. 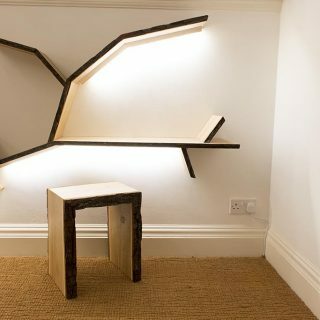 Our newest tree shelf commission has brought with it a whole new element to the designs that we can now offer by incorporating lighting throughout its branches. 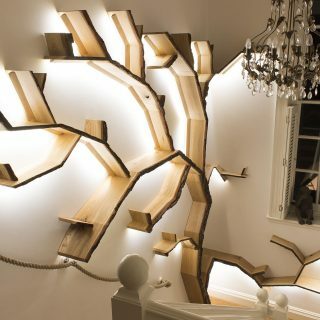 We were approached to design a tree shelf that would make an interesting and unique feature out of an existing large, blank wall space. Very often overlooked, staircase walls are difficult to access and are a large area of the house that is usually just left as is. 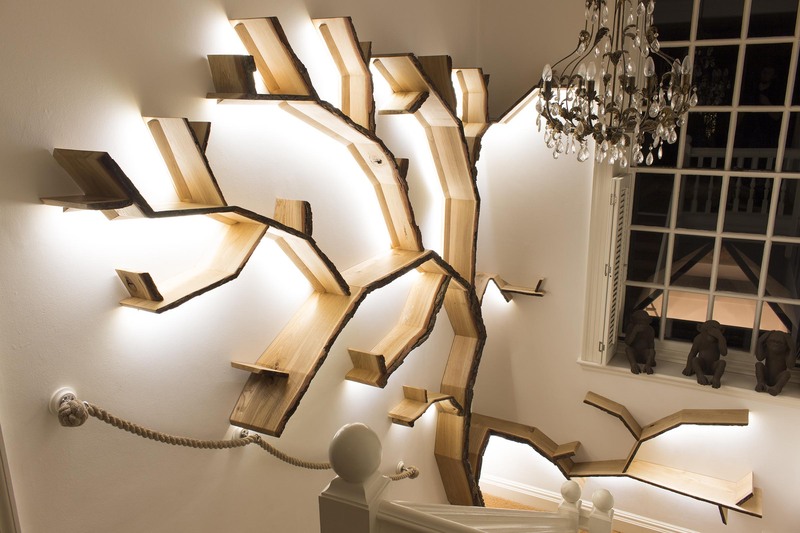 A staircase is a fantastic space for the bespoke design of one of our tree shelf installations. 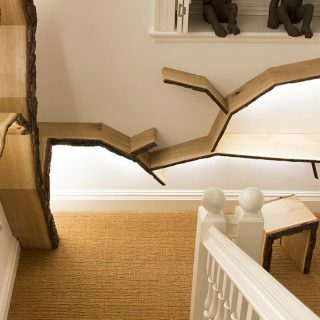 Spanning the floors of a house they very often present a tall, wide, inclined canvas to work with making them an ideal space for fitting a tree shelf into. 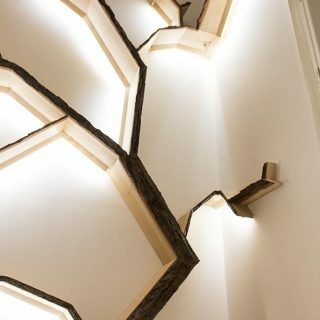 To add a whole new element to the design we incorporated lighting into this tree. This is the first time that we had done this and the results at the end were incredible! All of the cabling was run through channels cut out in the back of each branch meaning it is completely sealed. The transformers for the LED lights were set inside the base of the trunk meaning they too were out of sight. Upon fitting the tree we decided to add some oak diffusing pieces to go over the lights. 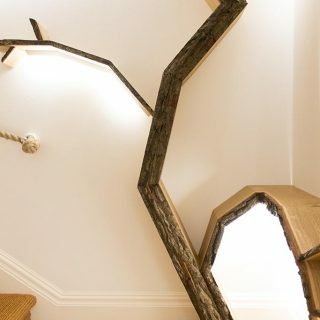 As the tree can be seen from a wide range of angles when walking both up and down the stairs, there were a lot of places where the direct light was dazzling and detracted from the natural look of the tree. 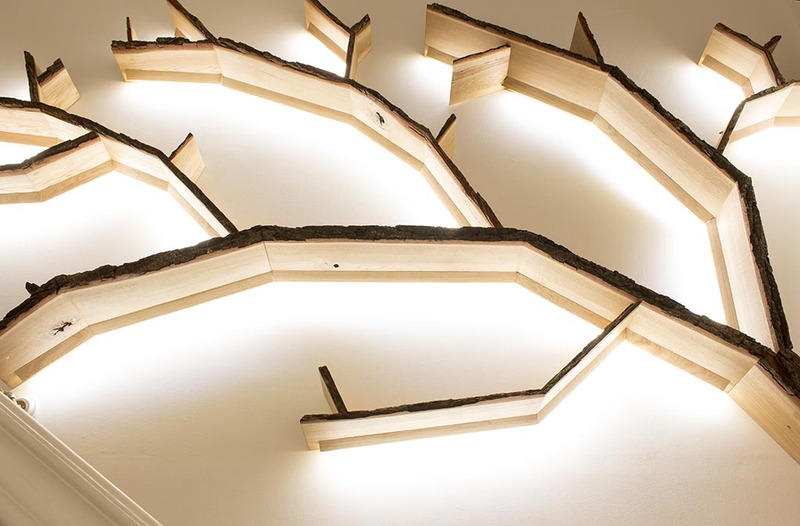 The diffusing pieces allowed us to control this by individually setting each one after installation. This also allowed us to adjust the shadow of each light against the wall, to make sure the light coverage was even throughout the tree. 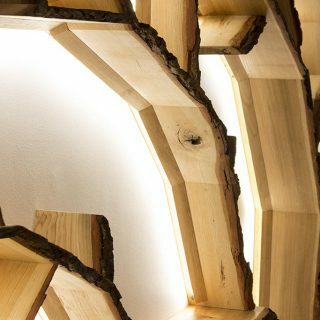 The tree design itself came from our standard Windswept Tree shelf, which gave us the starting point and inspiration for the design. We then added corner features to make the most of the available space. The branch that comes around under the window has an increased depth to create a reading area for the young children. You will notice we also included a matching bark edge stool with the tree to fit in seamlessly with the design. 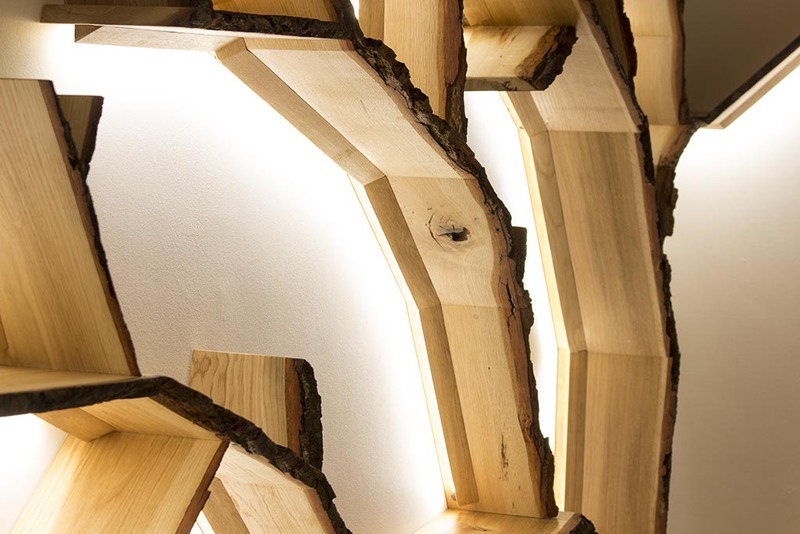 We are intending to offer lighting as an option across our full tree shelf range later in the year and look forward to offering this as an option on future commission work as well. If you would like to talk to us about the possibility of a similar commission then please get in touch, we would love to hear from you!